Here Erin uses an Aperture Rule to work on vergence and fusion skills with a child. While looking through the window at a series of targets, the child learns to fuse two images (one seen by the right eye and the other seen by the left eye) into one. 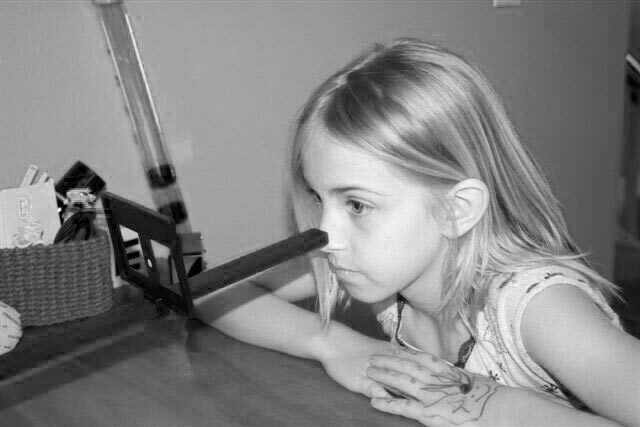 This device trains divergence (moving the eyes out) and convergence (moving the eyes in). This is nice to use because it can be taken home. Our vergence system is one of the main neurological systems telling us where things are in space. One of the very first techniques we teach is the Brock String. It is a very simple technique that gives the child incredible feedback and is often sent home with the child. The brock string teaches awareness of eye aiming at various distances while checking for suppression (shutting an eye off). It can also be used for vergence facility training later along in the program. 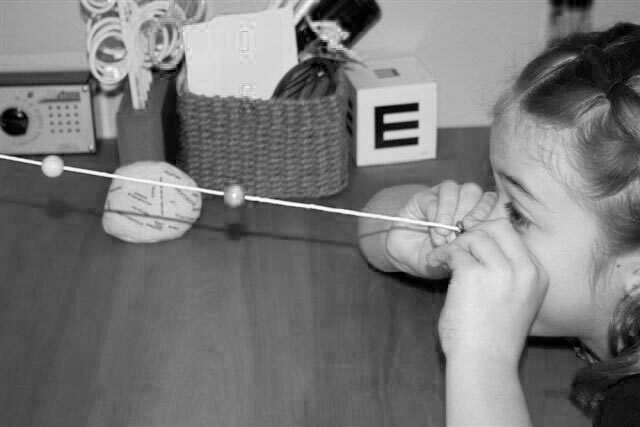 The Marsden Ball is used for eye tracking (fixation and pursuits) but can also be handy for eye hand coordination. 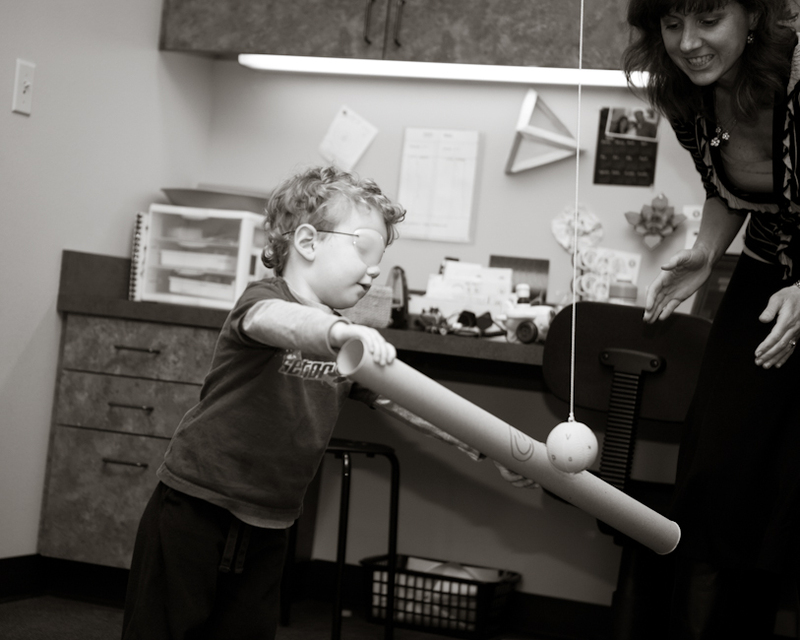 This 2 year-old is able to work on his coordination and eye alignment very easily while keeping the ball under control. The Rotator is a tracking instrument used to improve your ability to accurately direct your eyes from one point to another point with ease and efficiency. The child is asked to locate holes place golf tees in a rotating pegboard. As the child's skill improves, the speed at which the pegboard is rotating is gradually increased. This procedure is usually done while the patient is wearing a patch over one eye. The focusing system is telling the child what things are, identifying them. Sometimes a child does not have any control over their focusing system and doesn't recognize blur and know how to make things clear. We use Lenses to train focus (accommodation) and teach awareness and the appropriate visual response. Here we are using a flipper that has minus lenses on one side and plus lenses on the other. The minus lenses cause the brain to tell the eye to focus and the plus tell it to relax. Paying attention to the stimulus and teaching the brain to respond appropriately is the key to this activity. The stimulus can vary, here we are using a hart chart. Red-Green Lenses and Filters can be used to train a child out of suppression. Suppression happens when the brain shuts off information coming from an eye. This happens when the image is blurry, double or confusing in some way. 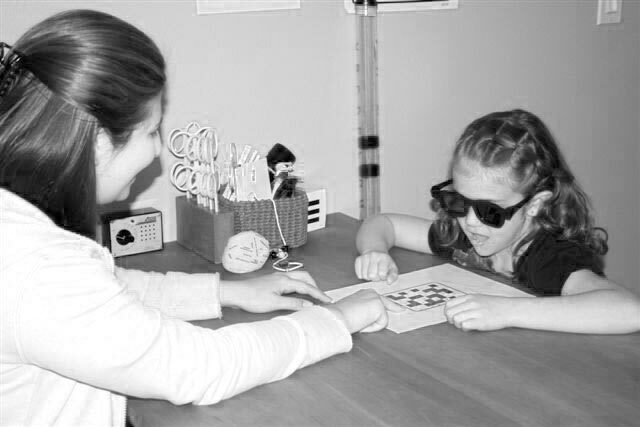 It is a neurolgically adaptive behavior and is a sign of an unstable visual system. Since vision therapy enhances binocular vision (two-eyed) both eyes must be turned on and working. 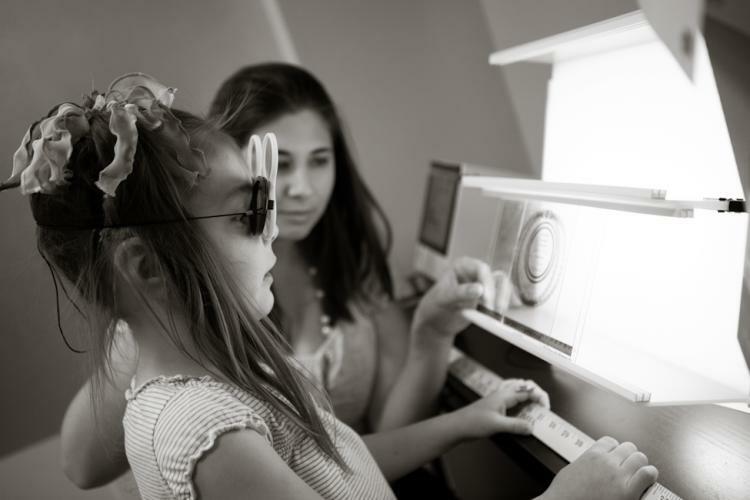 These lenses help give the child feedback so they know when one eye shuts off as they can only see part of the target. 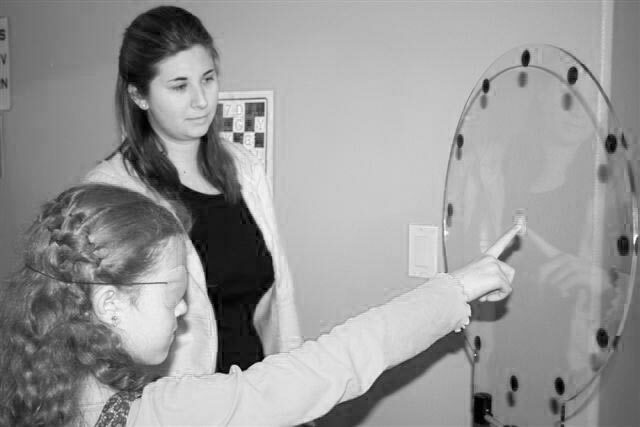 "Look, Ready, Touch, Back Fixations" done on a Space Fixator trains eye fixations and divided attention. This activity is great for helping integrate all aspects of sense and is wonderful because it is fun and kids love it. The fixator spins if it is hit too hard so it gives feedback and teaches spatial awareness. The activity is done to a metronome which helps decrease the time between when you decide to do something (like look) and when you do it. Vectograms are polarized slides used to train stereopsis (depth perception) and central and peripheral anti-suppression. They also allow for vergence training and teach a variety of skills like recognizing parallax and size differences. 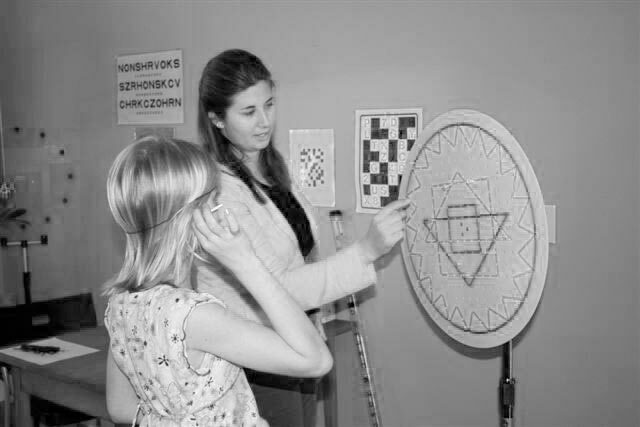 Vectograms are fun and provide a varied target that children find interesting. 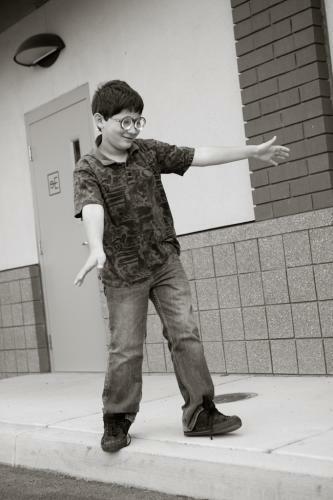 Prisms and balance boards can be added to further imbed the learned response so that the child can transfer what he is learning to other experiences. Yoked prisms are very fun to use in therapy and help turn on different visual pathways in the brain. This is one technique we use to "tickle the brain". Here the patient is working on balance and walking wearing yoked prisms. We can use any eye-hand or eye-body activity to work on this. Sometimes just standing up with yoked prisms on can be therapeutic. Here Jodi spins Mason on the astronaut board while Dr. Marshall stabilizes his head. This technique allows for vestibular stimulation while encouraging visual dominance.